1. New timeline event: March 14, 2016, Time Warner Center, NYC. 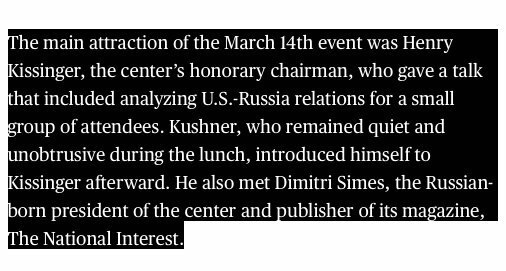 Kushner met Henry Kissinger and Dimitri Simes, both from the Kremlin-linked "Center for the National Interest". 2. The new conspiracy event brings @CNN executives into the narrative. Kushner was invited by execs at #CNN and #HBO's parent company, #TimeWarner: Richard Plepler and CEO Jeff Bewkes. 3. And another bombshell: Former #TimeWarner CEO Jeff Bewkes is ON THE BOARD for the Kremlin-linked Center for the National Interest. A reminder, #CNN Pres Jeff Zucker helped propel @realDonaldTrump to the Presidency.